We knew when we bought the condo we would have to redo the kitchen. However, we didn't realize we would be moving out so quickly! Therefore, since we knew we would just be renting it out for a while, we decided to reface the cabinets instead of doing an entire renovation. If you have a full weekend this should not take you long. To remove cabinets/hardware and prep for paint should only take a couple or three hours, depending on the number of cabinets. 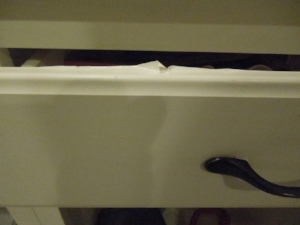 The plastic film on our cabinets was a breeze to remove. The painting will take the most time, because of the wait time in-between layers. What you couldn't see in the previous photo is the damage to the cabinets. As you can see here, these cabinets are inexpensively made, plastic covered, faux wood cabinets. But, not to worry! We can work with these for a little while. Before you begin, you must remove all hardware, keep in separate baggies, and number the doors and baggies. 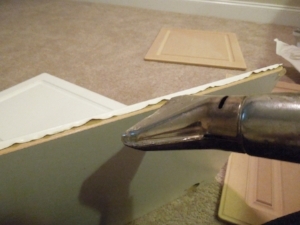 This will ensure all pieces fit the same way they did before the refacing. The heat gun will melt the plastic at the sides. Just heat and pull it right off! You then want to clean the surfaces with a very strong cleaner to remove the adhesive residue. Sand the surface lightly to prep. It is now time to paint! Be sure to prime the surface before applying paint. This will allow for a stronger bond. Once dry, you can apply the first layer of paint. It is preferable to use a satin or gloss finish. Then apply the next. We only applied two coats. I decided to also apply a polyurethane in a gloss finish for durability. Be careful to ventilate well because the fumes are strong. Finished project! Now time for some white paint, new hardware and backsplash!